Looking to provide a remarkable follow-up to the popular S4, Samsung has delivered with the addition of the all-new Galaxy S5. This device, in particular, boasts many features for the outdoorsman, something that aligns greatly with the Rokform brand. The most prominent “outdoors” feature is that it is dust and water-resistant. The S5 also has a built-in heart rate sensor on the back of the phone to directly measure your heart rate. The S Health application is also enhanced on the S5, giving users the ability to set and achieve goals with additional fit accessories. In addition to the features that would perk any outdoorsman’s interest, the S5 has an improved camera that can easily capture all of life’s crazy and memorable moments. In order to keep all these amazing features of the S5 close, Rokform has gone above and beyond to create the Sport v3 case to offer superior protection with the newly patented Rokform Mounting System (RMS). 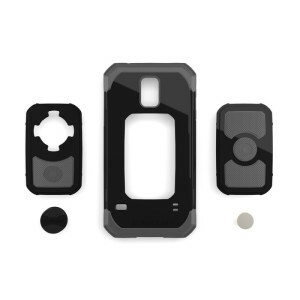 Unique to the S5 case, Rokform has provided two snap-in back pieces (see below), one with the RMS and one without, giving users more options for the look and functionality of their choice. The included integrated magnet also increases the mounting capabilities, allowing users to stick their phone to any ferrous metal surface. While we love to boast about our mounting solutions for our customers, the fact is that our cases provide the ultimate protection for your S5. The Sport v3 case features a tough outer polycarbonate shell with a shock absorbing soft inner liner. And don’t think we didn’t do the necessary testing. Our durable case withstood a six-foot drop. Pretty impressive. We’d like to think we won’t drop our phones, but life does happen and Rokform is here to help make sure your S5 is protected. When you pre-order the Rokform Sport v3 case, it’s just $39 and that includes a Car Dash Mount. All that protection and functionality for such a low price! If you are interested in pre-ordering, click here. Make sure to check out the additional accessories that complement the wide variety of mounting options offered by the complete lineup of Rokform cases.